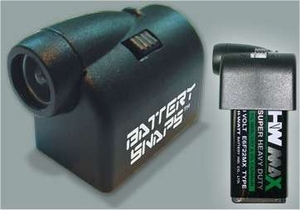 Great for those household emergencies, our Battery-Snaps� Instant Flashlight simply snaps onto any standard 9 volt battery and an instant flashlight appears before your eyes! Keep a few around the house and car, the simplest and coolest flashlight available today!! Brand new contemporary and unique design. LED lasts for over 100,000 hours and is virtually unbreakable. Chromed reflective housing to maximise LED brightness.